The following is a partial summary of the conclusions from the fxempire.com weekly analysts’ meeting. We stepped back from our normal weekly focus to form our outlook for the end of 2013 – start of 2014, as part of our preparation for our forecast for 2014. The US government shutdown’s data delay set us back about 3 weeks. Here is Part 2 of our 4 part series covering how the bullish and bearish forces align as we finish 2013 and transition into 2014. Click here to view Parts 1, 3, and 4. If you’re tight for time, go straight to Part 4 for the key conclusions you must know now. Since mid-2011, the principle of “don’t fight the fed” has worked worldwide, with stocks rising far faster than the economic and growth data that usually accompanies such rallies. This applies all the more so when the ECB and Bank of Japan are in easing mode, with others like the Reserve Bank of Australia joining in. As we suggested in our 2013 forecast here, since mid-2011, as long as central banks kept stimulus coming and EU crises anxiety remains muted, there was no reason to think the uptrend in stocks would change, or at least not reverse. The lesson here is one you’ve already heard before – don’t fight the Fed and especially don’t fight every Fed around the world when they begin to ease all at once. If the entities in control of trillions of dollars all want asset prices to be higher at the same time, what the hell else should you be positioning for? Yield seeking cash has few options besides equities. Regarding the Fed: Janet Yellin’s dovish remarks at her congressional confirmation hearings fed speculation that QE taper will be starting later rather than sooner. While all acknowledge the fed is moving with US economic data, especially that concerning jobs and inflation, it’s clear she’s inclined to want err on the side of caution and keep QE flowing until the data paints a clear picture of a recovery that has become self-sustaining. the chances of tapering beginning before March are clearly rising, and the 15bp surge in 10- year US government bond yields to the highest level since September, clearly reflect that this is the general perception. However, while the announcement of tapering and an eventual end to the Fed’s asset purchases will signal that the policy stance is at last stabilizing rather than being loosened continually, we suspect that the forward guidance could be shifted substantially. We also believe that the Bank of Japan is likely to add to its current, highly-aggressive monetary policy easing sometime next year, mainly to support government efforts to minimize the contractionary effects of the consumption tax hike. In short, it looks as if developed economies’ central banks will unleash further monetary easing on their economies and hence the global economy. Looking back since mid-2011, this “don’t fight the Feds/mother of all liquidity rallies” theme is really the heart of the bulls’ case, as it still applies to today. Let’s look further at the lack of stellar supporting fundamentals to match stellar stock index performance. 1. Growth And Earnings: Good Enough To Defuse Bubble Fears? Valuations are no longer cheap, but they are still a long way from the peaks seen in previous cycles. U.S. stocks trade for around 2.5x book value and for 16.5x trailing earnings. Looking at the last three major market peaks – 1987, 2000 and 2007 – price-to-earnings (P/E) ratios were respectively 23, 30 and 17.5. The price-to-book ratio, meanwhile, peaked at close to 5 in 2000 and 3 in 2007. As I discussed in August, valuations look more reasonable outside of the United States. Based on price-to-book measures, international stocks are 30% to 40% cheaper than U.S. stocks. On a relative basis, the earnings yield on stocks still compares favorably with the fixed income alternative. Compared to bonds, which have been bid up through central bank intervention, stocks still look cheap. Despite strong in-flows year to date, many investors are still underweight equities. Of course where one stands on the stock valuation debate depends on which measures one uses. As we’ll see in Part 3, the bears seem to have the more compelling valuation argument, but even they admit that while stocks are expensive, they aren’t necessarily in bubble territory and could stay that way for years, especially if stimulus stays mostly in place, and economic and earnings growth continue to improve enough to keep prices rising without trailing PE ratios noted in point 1 above rising towards 20 or above. The recent quarterly GDP, earnings, and monthly US jobs and manufacturing reports continue the trend in recent months of the US outperforming the rest of the developed world. US employment and inflation trends stand in particularly stark contrast to the EU and Japan. 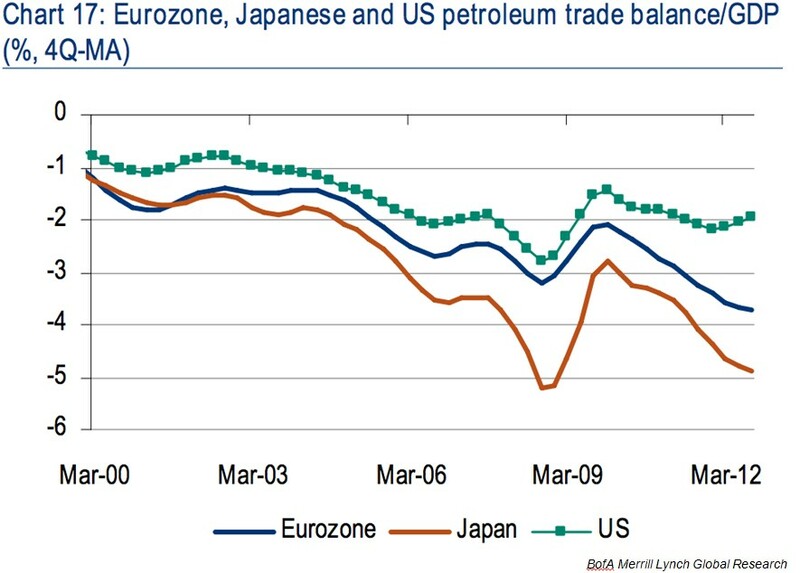 —First, he diminishing need for imported energy improves the energy component of the US balance of payments relative to other developed world economies (see chart below). The cut in imports and increasing rise in energy exports is bullish for the USD, which in turn makes US equities more attractive to the rest of the world. When the U.S. was more dependent on oil imports, rising oil prices meant the dollar weakened. As that dependence diminishes, so does that negative correlation between oil prices and the U.S. dollar. Second, the boom has not only strengthened the energy sector, it’s created a boom in a uniquely US type of equity, Master Limited Partnerships, (MLPs), the majority of which are directly involved in the expansion of US production and the infrastructure needed to transport, store, refine, and market the new production, both domestically and abroad. Over the past decade MLPs have lead all other classes of equities in both capital appreciation AND yield. While tax issues can make direct MLP investing problematic for non-US investors and US investors using tax-advantaged accounts like IRAs, an entire class of MLP wrapper products has arisen to meet this growing demand. So the energy boom and rise of MLPs create a growing source of non-domestic investor demand for these equities. If you’re not familiar with MLPs, stay tuned, we hope to come out with a unique primer on them soon, clear and comprehensive, yet avoids burying you in excessive technicalities. Fiscal austerity probably subtracted 1.5% to 2.0% from GDP growth in 2013, and the foolish government shutdown probably subtracted a little more. But even with contractionary fiscal policy, it looks like the US economy will grow in the 2% range this year. Ex-austerity (and ex-shutdown), we’d probably be looking at a decent year – maybe this would have been the best year since Clinton was President! 1) The housing recovery should continue. 5) And demographics are favorable going forward. Looking beyond Q4, we continue to expect a meaningful acceleration of GDP growth―to 3% in 2014Q1 and 3.5% for the remainder of the year―as the economy moves over the “hump” of fiscal contraction. Getting the exact timing of the acceleration in growth is tough, but the case for better growth next year is strong. The economy has healed significantly since the 2008-9 crisis. In particular, the government, households, businesses and banks have gone a long way toward fixing their balance sheets, allowing them to slowly shift their focus from balance sheet repair to expansion. We expect GDP growth to exceed 3% in the back half of next year as the federal fiscal drag drops from ~1.5pp in 2013 to ~0.5pp in 2014. Note however that disappointing September trade deficit figures have economists cutting their estimates for final Q3 GDP growth. While most Wall Street analysts think the good times will continue to roll in through 2015, former long-time bear Gluskin Sheff’s David Rosenberg recently wrote that while there are multiple signs of a correction coming, even the bulls have noticed them and expect a pullback. However that very expectation can prevent it. But it may well be this near universal perception of a correction that means we may not see one… at least one of a 10% variety which we have not seen now for 530 trading days. But the reality is that such a string isn’t altogether that rare— we didn’t even have one 10% setback in that entire 2003-2007 bull run to the highs at the time. And from October 1990 to October 1997 (1,767 sessions), there was not one 10% correction. Now historically, they do tend to occur every 30 months in the context of a bull market, but while we may be long overdue for one, the main theme here is that it is not unprecedented go this long without one. In fact, the rally is so entrenched that the S&P 500 could still correct about 10% without violating its long term uptrend lines. Mediocre enough to keep taper fears at bay. That means mildly negative news that suggests stagnation or a weak recovery, but not material deterioration, could well be seen as bullish and feed further rallies. Positive enough so that investors believe the recovery can continue with the taper. In any case, as Bernanke warned last week, yields on 10 year treasury notes would have to stay under 3% to prevent inflation concerns from being a taper trigger. Higher Discretionary Income: In the past 12 months, gasoline prices are lower by roughly 5 – 10%, and 1.3 million more people are fully employed, per the Bureau of Labor Statistics. The Hurricane Sandy Effect. The year-over-year comparisons will benefit from the November 2012 drag on spending from Hurricane Sandy. The Wealth Effect: People tend to spend more when they feel wealthier. This year’s gain for the S&P 500 (and most developed world global indexes), as well as rising home prices, mean 2013’s holiday season has another advantage over 2012’s. The October retail sales report’s beating expectations also adds to the optimism. Gluskin Sheff’s David Rosenberg noted that the strong growth showed in restaurant sales (up 1%, on track of a 6% annual gain) was particularly bullish. He reasoned that eating out is the most discretionary kind of spending, so if consumers are eating out more, they won’t hold back on holiday shopping. He suspects the windfall from lower gasoline prices as a major reason for the added spending. US indexes are at or near all-time highs and in multi-year uptrends. Other leading global indexes are at minimum at multi-year highs. 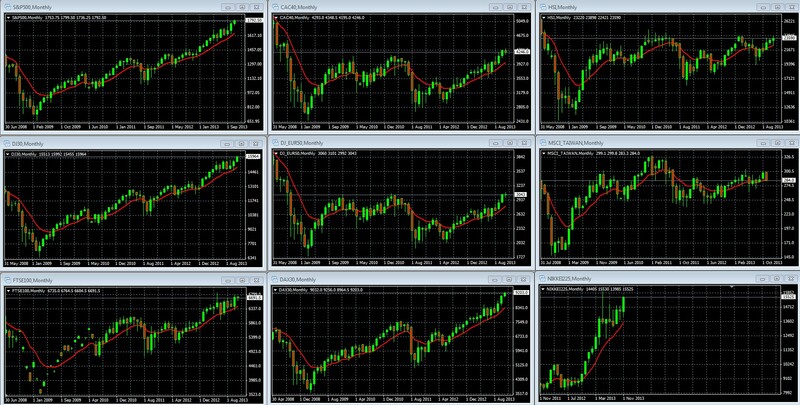 See the set of 9 long term monthly charts of US, European, and Asian major stock index charts in section 1 above. Unless there’s a weakening of the above fundamentals, especially of widespread central bank dovishness (#1 on our list), that means when in doubt the tie goes to the bulls and indexes can more easily continue to move higher. They can also sustain a pullback without damage to the multi-year uptrends. To view other parts click on the following links: PART 1, PART 3, PART 4. If your pressed for time, PART 1 and PART 4 are what you need to see now. They provide the overview, summary and conclusions. Then you’ll know if you need to read the rest. PART 3 reveals what could send markets plunging.